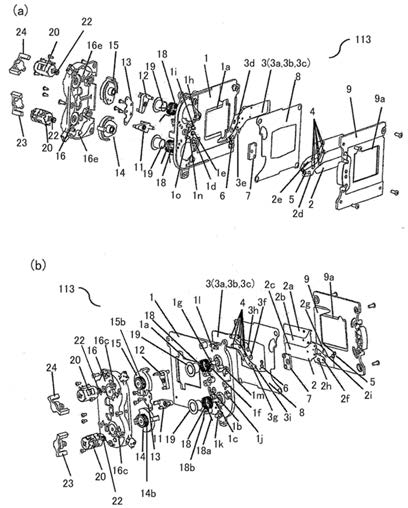 In order that the shuttering device disclosed in the Patent document 1 may stabilize exposure operation, after making a cam member stand it still, the switching action of a shutter is performed. However, in order that a cam member may stand it still by abutting a separate member, by the rebound phenomenon by abutment with a separate member, etc., time is taken for a cam member to stand it still, and top ** at the time of continuous shooting becomes slow. Then, in the shuttering device in which an exposure run of reciprocative direction is possible, the object of this invention is realizing stable and high-speed operation. As with all patent applications, we know this is an area of Canon R&D however, it doesn't mean it will or will not make it into products any time soon.